This is a new section I’m starting on the blog, writing on Saturday Prompts at Write Tribe. What is it? Every Saturday Corinne gives out a prompt – a word or a photo around which we need to weave a story within 100 words– fiction, non-fiction et all. I like doing these prompt responses. Sometimes I feel they challenge your creativity and it’s a nice way to break the thoughts of ‘what am I going to write today?’ And the best part is, it is 100 words. So it’s a relief for the readers too. Often I tend to write very elaborate stuffs even when I had thought of keeping it short! So here goes my 100 word story. The words pierced through his heart. ‘I gave my life’s savings for his business… this is how they abandoned me!’ thought a fragile Rahim watching his son leave with his family. ‘I’ll see if I can send some money’, his son had said. Rahim refused to give up his dignity. His own blood had betrayed him, but he knew his old bike won’t. 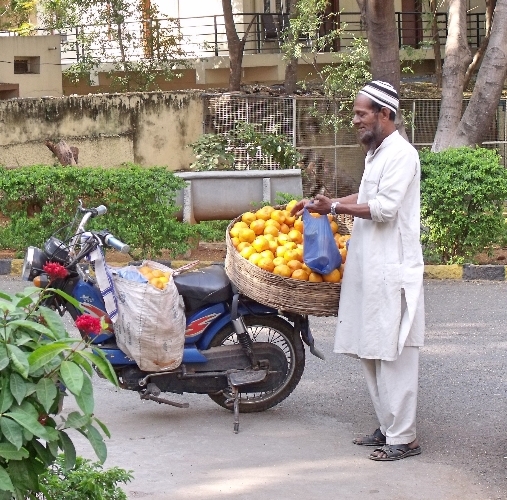 No one had ever seen the fruit-seller without his trade mark smile, even when customers bargained furiously. Rahim was happy to meet new people. But none knew the loneliness behind the friendly smile. This post is written against the inhuman act of abandoning old parents. Parents give their sweat and blood in bringing up their children and abandoning them in their old age should be regarded as a crime. I have known some old age homes closely due to my mother’s social work network and it feels disgusting to know that many have not heard a word from their wards in years. Their children are settled abroad and some even send money but no one has time to pick up the phone or even come down for the last rites after their death. We wouldn’t need an old age home, only if people were more sensitive. If you like my blog and posts that I write CONNECT ME ON SOCIAL MEDIA and never miss a post. The post is written for #100WordsonSaturday on Write Tribe. Also linking it to UBC day 13. I so agree with your point about the young abandoning their parents, Tina. Great little story, which fits the picture perfectly. Well done. Very important post. I completely agree. I would have done anything to have had the opportunity to care for my parents in their old age but they died young. Lovely, Tina. The interpretation is quite close to the truth too. I haven't participated in Write Tribe in a while, but this could be fun! I also have the gift of written gab and tend to write over a thousand words per post. I just can't seem to grasp short and to the point. So sorry for your loss. But I would do anything to be with my parents. That's what I'm trying to curb – the itch to expand story. How Sad! However, Glad that Rahim din't break down and decided to stand on his feet with pride. A thought provoking story. Wish the youngsters knew what they are doing. A sad reality for so many! A wonderful interpretation of the picture prompt! Such a beautiful post on an issue i have experienced myself…I never understood how come people are so mad about money (property primarily). Don't they fathom their parents would have sacrificed so much for them in life! Kalyug as we say is upon us! I feel sorry for you. Kalyug is here. Thoughtful interpretation Tina! Very good interpretation of the prompt! What A Touchy story Tina ! :-). The nemesis of a materialist world.Money has taken over emotional bonds. Brilliant write Tina.